Early in his political career, an opponent of William McKinley’s gave him a red carnation boutonniere to wear during a debate. McKinley went on to win that debate and then the congressional election in 1887 (he served in the Ohio House of Representatives for 14 years), and he saw this red carnation as his good luck charm. He began wearing one during all election cycles, including his two gubernatorial wins and his 1896 presidential campaign. 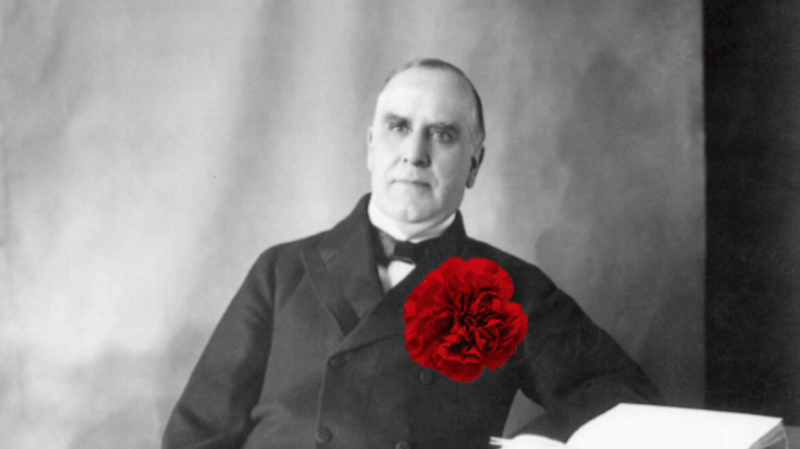 After his first presidential win, McKinley started wearing a single carnation in his lapel at all times. He even kept a bouquet of them on his desk in the Oval Office and would gift them to visitors. McKinley—who was born on January 29, 1843—was also known to give people the flower from his lapel, though he would replace it as quickly as possible. In 1901, months after his second term in office began, he was in Buffalo, New York for the Pan-American Exposition. While greeting the public, he met a 12-year-old girl named Myrtle Ledger who was there with her mother. Years later, Myrtle recalled that President McKinley said, “I must give this flower to another little flower,” and then he gave her his lucky carnation. Minutes later, McKinley greeted another person in line—his assassin, Leon Czolgosz. The president was shot twice and died the following week from gangrene. Three years later, the Ohio General Assembly named the scarlet carnation the official state flower in his honor.